Keep clothes clean with a discreet alternative to an adult bib. The Napkin at Your Neck mimics a napkin tucked into your shirt, but is long enough to cover your lap and stays in place with an adjustable strap. The polyester/cotton blend is stain resistant and machine washable. Also available in large. Made in the USA. 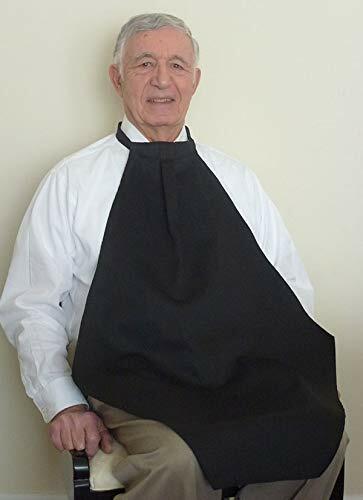 KEEP YOUR DIGNITY with this fashionable dining scarf adult bib. Stylish, Discreet & Practical. STAIN RESISTANT, MACHINE WASHABLE, WRINKLE RESISTANT. Made with a 65/35 polyester/cotton twill and lasts through countless washes. Makes a GREAT GIFT! Made in the USA. ADD'L STYLES available - see DinerWear. If you have any questions about this product by DinerWear, contact us by completing and submitting the form below. If you are looking for a specif part number, please include it with your message.